Korea has made an excellent start in the 2nd Nong Shim Spicy Noodles Cup, an international team tournament among Japan, China, and Korea. The opening rounds of the tournament witnessed the emergence of yet another young Korean star: Ch'oe Ch'eol-han 3-dan, who is just 15 years old. He got Korea off to a roaring start by winning three games in a row before falling to Japan's Kobayashi Satoru 9-dan. This outstanding debut by Ch'oe, a player not previously known outside his home country, testifies to the wealth of go talent in Korea. The first stage of the tournament was held in Beijing. In the first game, played on 17 October, Ch'oe (B) defeated China's Yu Ping 6-dan by resignation. In the second game, played on the 18th, he beat O Meien 9-dan, the Honinbo title holder, by 7.5 points. The next day, he continued his run by defeating Liu Jing 8-dan of China by 1.5 points. It was only in the fourth game (20th October) that he ran into an opponent capable of taking his measure; that was Kobayashi Satoru, who won by resignation playing black. The final of the 33rd Haya-go Championship (telecast on 15 & 22 October) featured a clash between two Kobayashis: Satoru and Koichi. The former was victorious, defeating Koichi by 3.5 points holding black. This was his first win in this title (Koichi has won it four times) and takes his tally of titles to nine. Two games in the 56th Honinbo league were played last week, completing the first round of the league. In one game, ex-Honinbo Cho Sonjin 9-dan (W) defeated Oya Koichi 8-dan by half a point. In the other, Cho U 6-dan (B) defeated Yamada Kimio 8-dan by resignation. The other two winners in the first round were Otake and Yuki. The second game in the 19th Women's Honinbo title match was played at Dake Hot Spring, Nihonmatsu City, Fukushima Prefecture, on 18 October. Playing black, Chinen Kaori beat the challenger, Inori Yoko 5-dan, by resignation, so she has leveled the score in the match. The third game will be played in Tokyo on 25 October. Osawa took the early lead, but Kikuchi fought back tenaciously and finally staged an upset in the endgame. Since Nakazono Seizo also won his first game, the amateurs have scored 2-3. It will be interesting to see how far Nakazono and Kikuchi can get in this tournament. A game in the Gosei preliminary round ended after just 33 moves when one of the players hallucinated. It was played on 19 October and the unfortunate player was Obuchi Morito 9-dan, who had to resignaiton early to Ryu Shikun 7-dan. 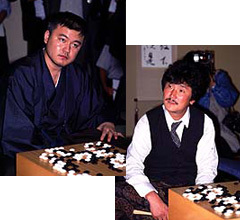 The shortest game that we know of in Japan lasted just 20 moves (it was played on 21 November 1996 in the 2nd preliminary round of the 53rd Honinbo tournament; Ono Nobuyuki 6-dan lost to Kudo Norio 9-dan); this game is a tie for second shortest. Kobayashi Kenji, older brother of Satoru and Chizu, won promotion to 7-dan in an Oteai game played on 19 October. Catalin Taranu (B) defeated Akedo Kazumi 6-dan by 8 points in an Oteai game played on 19 October. Neither Michael Redmond nor Hans Pietsch had a game last week. Rui Naiwei has won the Women's Kuksu title, to go with the open Kuksu title that she won at the beginning of the year. She defeated the 15-year-old Cho Hye-yeon 2-dan 2-1. The deciding game was played on 11 August. Rui's win may seem natural, but the fact that Cho managed to win a game showed that she is no ordinary teenager. She is obviously already one of the world's top women players. At the age of 34, Yoda Norimoto has finally won his first big title, beating Cho Chikun by the surprisingly lopsided score of 4-0 in the 25th Meijin title match. The fourth game was held in Takasaki City, Gumma Prefecture, on 11 and 12 October. Playing white, Yoda forced Cho to resignaiton after 198 moves. The game finished at 7:19 pm on the second day. Yoda was born in Iwamisawa City in Hokkaido in 1966. He became professional shodan in 1980 and made 9-dan in 1993. His previous top-seven titles are the Judan title in 1995 and 1996 and the Gosei title from 1996 to 1998. This was his third challenge for a top-seven title and his second successive Meijin challenge. CCho Chikun finds himself without a title to his name for the first time for 12 years. From 1989 to October this year, moreover, he always held at least one of the big-three titles, which is a record for longevity. Now that he is simply Cho 9-dan again, he will probably try all the harder in his challenge for the Oza title against O Rissei. The question is whether or not the shock of losing the last title in his Triple Crown causes him to fall into a slump. Cho Sonjin has scored his first triumph since his setback in the Honinbo title this year. Some fans were wondering if he was just a flash in the pan, but his consistent results in tournaments over the last couple of years, not to mention his second place in the 4th Samsung world championship, prove otherwise. He has now given himself a chance of challenging for the Kisei title. The final round in the B league was played on 12 October. Playing white, Cho Sonjin 9-dan defeated Ishida Yoshio 9-dan by resignation. This must have been a bitter disappointment for Ishida: he had led the league all the way, but ending in a tie with Cho was not good enough. There is no play-off in the Kisei leagues, and Cho wins the league by virtue of his higher initial ranking. In other games, Cho U 6-dan (black) defeated Miyazawa Goro 9-dan by 1.5 points and Hikosaka Naoto 9-dan (B) defeated Hasegawa Sunao 9-dan of the Kansai Ki-in by resignation. Cho Sonjin will meet Awaji Shuzo in a one-game play-off to decide the challenger to O Rissei Kisei. Hikosaka and Hasegawa drop out of the league. Western members of the Nihon Ki-in played only two games in the first half of October, both of them in preliminary rounds of the 26th Kisei tournament. In one of them, Michael Redmond 9-dan (B) beat Kanagawa Masaaki 7-dan by resignation; in the other, Catalin Taranu 4-dan (B) lost to Hosaka Mayu 2-dan by resignation. The final of the 7th Kiriyama Cup (actually the second title under the new sponsor -- for the first five years, it was the Acom Cup) was held in Kyoto at the headerquarters of the sponsor, the Agon sect of Buddhism, on 8 October. It featured the same pairing as last year's Honinbo title match and the result was the same: a victory for Cho Sonjin over Cho Chikun. Playing black, Cho Sonjin forced Cho Chikun to resignaiton. This is Cho Sonjin's first title win since he won the Honinbo title. It is also his first Acom/Kiriyama title and his fourth title overall. The first game of the 19th Women's Honinbo title match was held in Okinawa, on 11 October. Despite playing on home ground, the defending champion, Chinen Kaori, made a bad start. The challenger, Inori Yoko 5-dan, won the game by resignation, playing black. The second game in the first round of the 56th Honinbo league was played at the Nihon Ki-in on 12 October. Playing white, Otake Hideo 9-dan defeated Hane Naoki 8-dan by resignation. The play-off to decide the challenger for the 42nd Okan (crown) title, which is open only to members of the Nagoya branch of the Nihon Ki-in, was held on 12 October. Yamashiro Hiroshi 9-dan (W) defeated Ogata Masaki 9-dan by 1.5 points, so he will challenge Hane Naoki for the title. Yamashiro has won this title 11 times in the past, which is a record. Hane will be trying for three years in a row. Michael Redmond has achieved one of his main goals in becoming a professional: promotion to 9-dan. He earned the promotion by defeating Izumitani Masanori 7-dan (black, no komi) by resignation in a game played on 27 September at the Nihon Ki-in. Michael is the first player born outside East Asia to make 9-dan. He became shodan in 1981, so it has taken him 19.5 years to reach the top of the professional ranking system. It took him just four years to go from 8-dan to 9-dan, which is fairly rapid. Yoo Chang-hyuk 9-dan (Korea) beat Kang 3-dan (Korea), Yamada Kimio 8-dan (Japan) beat Rui Naiwei 9-dan (Korea), Seo Bong-soo 9-dan (Korea) beat Cho Hun-hyun 9-dan (Korea), Yang Yae-ho 9-dan (Korea) beat Zhou Heyang 8-dan (China). Apparently Rui let slip countless winning chances in her loss to Yamada. Yang took revenge on Zhou for his defeat of Lee Chang-ho. The first two rounds of the 2nd Hung Chang Cup, a women's professional world championship, were held on 28 and 30 September. Below are some of the results from the first round and all from the second round. Round 1 (28 September). Kobayashi Izumi 4-dan (Japan) beat He Xiaoren 5-dan (China), Huang Yum 3-dan (Korea) beat Nancy Kim (USA), Guo Juan (Europe) beat Hyon Mi-jin 2-dan (Korea), Li Chunhua 5-dan (China) beat Lee Young-shin 2-dan (Korea), Yun Young-son 2-dan (Korea) beat Osawa Narumi 2-dan (Japan), Xu Ying 3-dan (China) beat Yun Yong-min 1-dan (Korea), Aoki Kikuyo 8-dan (Japan) beat Chen 6-dan (amateur) (Chinese Taipei). Round 2 (30 September). Park Ji-eun 2-dan (Korea) beat Kobayashi (Japan), Hua Xueming 7-dan (China) beat Huang (Korea), Zhang Xuan 8-dan (China) beat Kwon (Korea), Cho Hye-yeon 2-dan (Korea) beat Guo (Europe), Li (China) beat Chinen Kaori 3-dan (Japan), Yun Young-son (Korea) beat Okada Yumiko 4-dan (Japan), Rui Naiwei (Korea) beat Xu Ying (China), Aoki (Japan) beat Lee Ji-hyon 2-dan (Korea). There are some interesting pairings in the quarterfinals, scheduled for January 2001. Rui Naiwei will play Japan's top woman player, Aoki Kikuyo, who recently won promotion to 8-dan. Park Ji-eun, one of two teenage stars in Korea, will play Hua Xueming of China. Park, aged 16, beat Cho Hun-hyun earlier this year. The other Korean teenage star is Cho Hye-yeon, who will play Zhang Xuan. The final quarterfinal matches Li Chunhua of China and Yun Young-son of Korea. The last three games in the Kisei A league were played on 5 October. 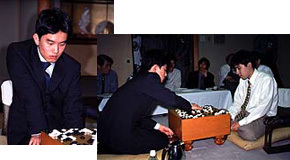 Awaji lost his final game, thus failing to maintain his perfect slate, but this game was irrelevant, as he had already won the league after the fourth round. It meant something to his opponent, Yo Kagen, however, as this was his first win in the league. Yo Kagen 9-dan (B) beat Awaji by resignation. 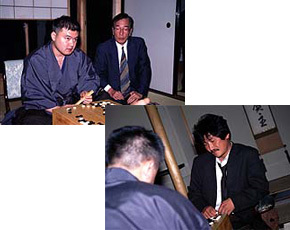 Cho Chikun Meijin (W) beat Imamura Toshiya 9-dan by resignation. Ryu Shikun 7-dan (W) beat Ishida Atsushi 8-dan by resignation. The bottom two players, Imamura and Yo, lose their places in the league. The first game in the 56th Honinbo league was played at the Nihon Ki-in on 5 October. Yuki Satoshi 9-dan of the Kansai Ki-in defeated Cho Chikun Meijin by 5.5 points playing black. Former Honinbo Cho has thus made a bad start to the league. Cho is much stronger in two-day games than in one-day games; he has also never lost a challenge for a big-three title. The problem for him is that once he loses a big-three title, as he did the Kisei last year and the Honinbo this year , it's very hard for him to become the challenger, as all other games apart from the big-three title matches are one-day games. Recently there have been some signs that Takemiya Masaki might be coming out of his prolonged slump (his score to the end of August this year was 12-16). In a game played on 5 October, Takemiya defeated Rin Kaiho 9-dan by 1.5 points, playing black, and so reached the final of the winners' section in the 39th Judan tournament. His opponent there will be Yoda Norimoto. Fans of Takemiya's 'cosmic style' will be hoping to see him make another title-match appearance. Both the other two Western members of the Nihon Ki-in also won their games in the last week of September. In the 26th Kisei preliminary round, Hans Pietsch 3-dan (W) defeated Kikuchi Yoshio 4-dan by resignation. In the second preliminary round of the 39th Judan tournament, Catalin Taranu 4-dan (B) defeated Yamashita Yorimoto 6-dan by resignation. Just failing to make the top ten is Yoda Norimoto 9-dan, who is on 26-9. Yoda Norimoto has swept to a 3-0 lead in the 25th Meijin title match and now looks almost certain to win his first big title. The defending champion, Cho Chikun, seems to be in bad form. In the old days, a 0-3 deficit meant nothing to Cho, but his recent results seem to indicate that he has passed his peak, losing the Honinbo title last year and the Kisei title this year. The third game was played in Kyoto City on 27 and 28 September. Playing black, Yoda won by resignation after 167 moves. The game finished at 7:36 pm on the second day. The next game will be played on 11 and 12 October. Two games were played in the 25th Kisei B league on 28 September. In one of them, Cho sonjin 9-dan (B) defeated Hikosaka Naoto 9-dan by resignation. This win keeps Cho's chances alive: the winner of the final-round game between him and Ishida Yoshio will win the league. 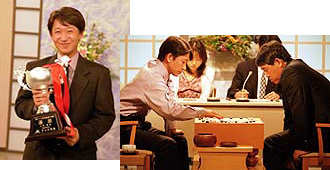 In the other game, Miyazawa Goro 9-dan (W) beat Hasegawa Sunao 9-dan by resignation. Scores in the league: Ishida 4-0; Cho Sonjin 3-1; Miyazawa Goro, Cho U 2-2; Hikosaka 1-3; Hasegawa 0-4. The second game of the 25th Shinjin-O (king of the new stars) title match was played at the Nihon Ki-in Nagoya branch on 28 September. Playing black, Yamashita Keigo, the new Gosei, defeated Hane Naoki 8-dan by resignation. That gave him the title with straight wins. Yamashita is the first player ever to win this title three years in a row. The fourth of the five amateurs playing in the 27th Meijin tournament made his appearance last week, but he was promptly eliminated. Miura Hiroshi lost to Kato Keiko 3-dan (B) by resignation. That makes the record 3-1 in favour of the professionals so far. The remaining amateur is Kikuchi Yasuro, who is scheduled to play Osawa Narumi.